The main adherent cell types derived from human muscle are myogenic cells and fibroblasts. Here, cell populations are enriched using magnetic-activated cell sorting based on the CD56 antigen. Subsequent immunolabelling with specific antibodies and use of image analysis techniques allows quantification of cytoplasmic and nuclear characteristics in individual cells. Agley, C. C., Rowlerson, A. M., Velloso, C. P., Lazarus, N. L., Harridge, S. D. Isolation and Quantitative Immunocytochemical Characterization of Primary Myogenic Cells and Fibroblasts from Human Skeletal Muscle. J. Vis. Exp. (95), e52049, doi:10.3791/52049 (2015). The repair and regeneration of skeletal muscle requires the action of satellite cells, which are the resident muscle stem cells. These can be isolated from human muscle biopsy samples using enzymatic digestion and their myogenic properties studied in culture. Quantitatively, the two main adherent cell types obtained from enzymatic digestion are: (i) the satellite cells (termed myogenic cells or muscle precursor cells), identified initially as CD56+ and later as CD56+/desmin+ cells and (ii) muscle-derived fibroblasts, identified as CD56– and TE-7+. Fibroblasts proliferate very efficiently in culture and in mixed cell populations these cells may overrun myogenic cells to dominate the culture. The isolation and purification of different cell types from human muscle is thus an important methodological consideration when trying to investigate the innate behavior of either cell type in culture. Here we describe a system of sorting based on the gentle enzymatic digestion of cells using collagenase and dispase followed by magnetic activated cell sorting (MACS) which gives both a high purity (>95% myogenic cells) and good yield (~2.8 x 106 ± 8.87 x 105 cells/g tissue after 7 days in vitro) for experiments in culture. This approach is based on incubating the mixed muscle-derived cell population with magnetic microbeads beads conjugated to an antibody against CD56 and then passing cells though a magnetic field. CD56+ cells bound to microbeads are retained by the field whereas CD56– cells pass unimpeded through the column. Cell suspensions from any stage of the sorting process can be plated and cultured. Following a given intervention, cell morphology, and the expression and localization of proteins including nuclear transcription factors can be quantified using immunofluorescent labeling with specific antibodies and an image processing and analysis package. The repair and regeneration of skeletal muscle requires the action of satellite cells1, the myogenic stem cells2,3. In vivo these cells exist in a reversibly quiescent state located between the sarcolemma and basal lamina of every myofibre, but become activated to proliferate, fuse and differentiate as muscle tissue is damaged, repaired and regenerated3. Satellite cells can be isolated from young and elderly human muscle biopsy samples using enzymatic digestion4 and their myogenic properties can subsequently be studied in primary culture5. The efficiency of this isolation process in regard to both yield and purity of cell population depends on the methods used and can vary from sample to sample. The two main adherent cell types obtained from enzymatic digestion are the satellite cells (now termed myogenic cells or muscle precursor cells), identified initially as CD56+/desmin cells, and muscle-derived fibroblasts, identified as CD56– and TE7+ cells5. 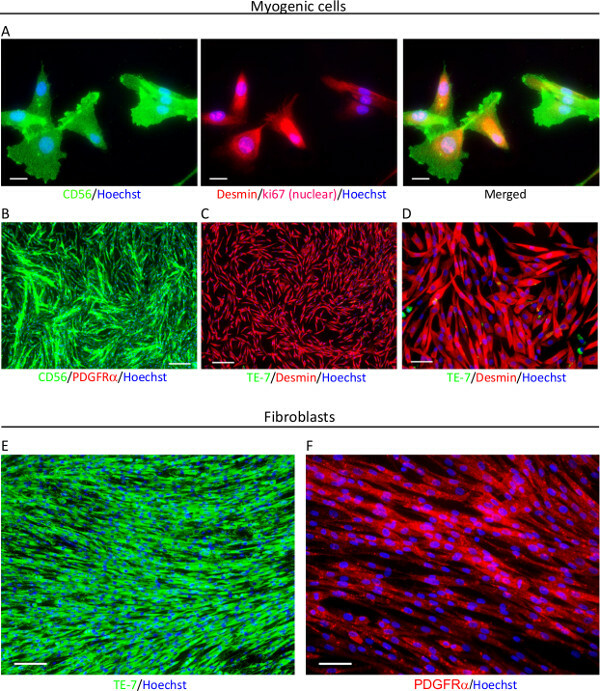 Fibroblasts have a rapid proliferative rate and do not undergo irreversible growth arrest and terminal differentiation upon cell-cell contact like myogenic cells; thus in mixed populations, fibroblasts may overrun myogenic cells to dominate the culture. Fibroblasts have often been viewed as an irritation for muscle biologists, however, there is now a growing interest in fibroblasts as cells worthy of study in their own right, particularly as they have been shown to have a cooperative role with myogenic cells during muscle repair6. The isolation and purification of different cell types from human muscle is thus an important methodological consideration when trying to investigate the innate behavior of both cell types in culture. Fluorescence-activated cell sorting (FACS) is a method by which cells can be sorted for further study and/or counted and analyzed. FACS has been shown to reliably enrich human myogenic cells, but the yield of cells for subsequent culture has thus far not been high7. Given the limited replication potential of somatic cells such as satellite cell-derived myogenic cells and the very poor proliferation and differentiation associated with senescence4, more gentle approaches are required. Single muscle fiber cultures offer another, less aggressive, means of obtaining murine satellite cells still resident in their sublaminal niche and after their activation in culture8,9. However, this is often not possible from human muscle biopsy material (because fibres can rarely be obtained from tendon to tendon) meaning that this technique may not be accessible to many research labs interested in studying human muscle-derived cells. Moreover, the single fiber technique only provides very limited cell numbers. Here we describe a system of sorting based on the gentle enzymatic digestion of cells using collagenase and dispase followed by two successive rounds of magnetic activated cell sorting (MACS) which gives both a high purity (>95% myogenic cells) and yield (~2.8 x 106 ± 8.87 x 105 cells/g tissue) for experiments in culture. CD56 is considered the gold standard surface marker for the identification of human satellite cells in situ10 and in vitro11 and provides the ideal surface marker candidate for bead attachment. In this approach CD56 antibodies conjugated to iron oxide and polysaccharide-containing superparamagnetic beads are bound to cells and passed through a high gradient magnetic cell separation column placed in a strong magnetic field12,13. The separation columns are filled with a matrix of ferromagnetic steel wool or iron spheres which serve to focus magnetic field lines towards their surface generating strong magnetic field gradients (~4tesla)14. In these columns even slightly magnetic cells are attracted and adsorbed to their surface14. Unbound (CD56‒) cells pass through the column whereas CD56+ cells labeled with magnetic microbeads are retained until removal from the magnetic field12,15. Cell suspensions from any stage of the sorting process can be plated at the desired density for further experimentation. Following a given intervention the cellular constituents can be identified using immunocytochemistry, imaged using wide-field or confocal fluorescence microscopy and analyzed quantitatively using an image analysis approach that allows rapid objective measurement of all labeled cells in any given image. In our laboratory we have used this double immunomagnetic sorting approach followed by image analysis16 to demonstrate that CD56– human fibroblasts readily transdifferentiate into adipocytes, whilst myogenic cells of satellite origin are highly resistant to this adipogenic conversion5. NOTE: For the studies performed in our lab all subjects gave their written, informed consent to participate and all experiments were performed with UK National Health Service Ethics Committee approval (London Research Ethics Committee; reference: 10/H0718/10) and in accordance with the Human Tissue Act and Declaration of Helsinki. Make human skeletal muscle growth medium. To a graduated sterile 50 ml conical tube add 2.5 ml of the supplement mix, 10 ml fetal calf serum, antibiotics (penicillin/streptomycin) and glutamine to the correct final concentrations (Table 1) then fill the tube to 50 ml with skeletal muscle basal medium. Put 15 ml of the skeletal muscle basal medium in a sterile 20 ml conical tube and weigh it. Once weighed place this tube on ice. Use this to receive the human muscle sample. In another 20 ml tube prepare 10 ml of a Collagenase D and Dispase II enzyme solution to a final concentration of 2 mg/ml each by dissolving stock aliquots of these enzymes in skeletal muscle basal medium. Filter-sterilize this solution by passing it through a 0.22 μm filter. Place this sterile enzyme mix in the incubator or water bath at 37 °C for 15 min to warm up. NOTE: This mixture of enzymes is slightly gentler than trypsin and better maintains cell viability17. Set aside a Petri dish and a pair of sterile scalpels. Prior to recruiting participants, obtain full ethical clearance and procedural approval (including relevant vaccinations for experimenters) from all relevant governing bodies, committees and healthcare providers (e.g., ethical, institutional, governmental etc.). Create a sterile field the around the leg (e.g., with sterile surgical sheets) and clean thoroughly the area around the biopsy site with an antiseptic antibacterial agent (chlorhexidine). Anaesthetize the proposed biopsy site on the volunteer’s leg by local injection of 2% lidocaine in the subcutaneous region overlying the fascia of the vastus lateralis muscle. Make a ~5 mm wide incision using a sterile surgical blade through the skin and fascia and perform the Bergström needle biopsy procedure18 with additional suction. Using sterile forceps remove the muscle from the needle lumen and immerse in basal medium on ice. Transport the tissue to the laboratory for further processing as soon as possible although viable myogenic cells can be obtained after periods 24 hr or more. Debrief the subject, cleanse and seal the incision site with multiple sterile adhesive skin-closure strips and aseptically dress with a outer waterproof covering. Remove the tube containing the muscle sample and weigh it (make sure tube is dry by wiping with tissue). Calculate the weight of the muscle sample by subtracting the weight of the tube containing medium and sample from the tube containing medium alone. Swirl the solution several times to wash the muscle sample of blood. Let the muscle sediment at room temperature for 30-60 sec. Remove almost the entire volume of medium from the tube, first using an electronic pipetting aid or aspirator but leave approximately 2-3 ml in the tube. Invert the tube on to a sterile petri dish allowing the remaining fluid to carry the muscle sample on to the dish; use the sterile scalpel to extract any remaining muscle fragments.Rotate the dish to mobilize the remaining liquid and remove it with a pipette.Remove any visible pieces of fat or connective tissue. For biopsies weighing 100-400 mg, add 3 ml of warm enzyme solution and using sterile scalpels cut the muscle sample into very small pieces (<1-2 mm3). Using a wide bore 25 ml pipette draw up the muscle fragments and enzyme solution and transfer to a sterile 10 ml conical tube. Wash the petri dish with a further 3-5 ml of collagenase and dispase enzyme solution and using a smaller 10 ml pipette collect any remaining muscle fragments and place in the tube. The exact volume is not critical. Place the vial in a 37 °C incubator (or water bath) for 60 min with trituration (10 ml pipette) every 15 min. After 1 hr terminate enzymatic dissociation by addition of an equivalent volume of fresh pre-warmed growth medium and pass the cell suspension through a 100 μm filter to remove any large myofibre debris. Centrifuge the filtered cell solution at 657 x g for 6 min at room temperature (20-25 ˚C). Resuspend the cell pellet in 5-7 ml of growth medium and plate in an uncoated T-25 tissue culture flask. Transfer this plate to the incubator at 37 °C with 5% CO2 for 7 days. Change the medium every 48 hr. At this stage myogenic cells are very small and rounded and difficult to discern from non-myogenic cells. On the first medium change, centrifuge the supernatant to pellet any non-adherent cells. Re-suspend these in fresh medium and re-plate. After 7 days in culture, ensure that most of the myogenic (and fibroblast) cells have attached but the cells have not yet reached confluence. Purify the myogenic precursors and perform MACS according to a protocol originally developed by in the laboratories of Gherardi and Chazaud19,20 and further modified by us5. After 7 days rinse the cell monolayer (which typically will contain 50-60% myogenic cells5) with three exchanges of room temperature phosphate buffer solution (PBS) to remove any remaining non-adherent cells and debris from isolation. Trypinize the cells (0.04% Trypsin in Ca2+-free PBS with 0.73 mM EDTA) for 3 minutes. Once cells have detached, add 5-10 ml of skeletal muscle growth medium to prevent over-digestion. Pellet the cells by centrifugation at 657 x g for 6 min at room temperature (20-25 ˚C) and resuspend in an appropriate volume of complete medium for counting. Count a small sample of the cell suspension using the desired method (e.g., using a hemocytometer or an automated counting device) and calculate starting cell number and viability. Plate a few wells in a 96 well plate (or larger vessel if required) for immunocytochemical or flow cytometry based characterization of the population prior to sorting (fibroblasts and myogenic cells will be the most abundant cells types present). To the cell suspension add 15 ml of sterile PBS to dilute cells and medium. Centrifuge the cells again and resuspend them in 170 µl of room temperature sorting buffer (1% BSA in a MACS rinsing solution, sterilized via passing through a 0.22 µm filter). Add 35 μl of well mixed magnetic microbeads conjugated to a CD56 primary antibody (clone AF12-7H3, 130-050-401) into the cell solution, pipette to mix and leave to incubate for 15 min at 4 ˚C with gentle agitation at the halfway point. After incubation, dilute the cell and bead solution with 10 ml of MACS sorting buffer and centrifuge at 657 x g for 6 min. Resuspend the cells in 1 ml of sorting buffer. Add the MACs separator (magnet) to the MACS holding stand. Take care when adding magnet to the stand due to the strong magnetic field. Slot in the column and fit the pre-separation filter. Pipette 1 ml of sorting buffer through the pre-separation filter and column for lubrication. Immediately after this, gently mix the cell suspension and drip the entire 1 ml through Pre-separation filter and into the column. Wash the column three times with 1 ml (or 500 μl) of sorting buffer. Collect the non-retained cells which pass through the column on the first sort in a sterile 50 ml conical tube containing a small amount of growth medium. These cells are the first sort CD56– fraction and will be highly enriched for connective tissue fibroblasts. Do not let the column dry out between washes. After washes the remove the pre-separation filter and add 2.5 ml of MACS buffer to the column. Then immediately remove the column from the magnet and collect the first sort CD56+ fraction in a separate 50 ml conical tube by depressing the plunger into the top of the column. NOTE: The plunger fits very tightly into the top of the column and can be quite tricky to operate; however, this must be done while the column is still full of buffer, so speed is required. Avoid depressing the plunger too hard and fast. Prior to plating assess the viability of the cells using, for example, the trypan blue assay. Determine the percentage of viable cells from 8 x 1 mm2 counting fields (both chambers of the hemocytometer). NOTE: The cells can be either single or double sorted depending on the purity required. If done carefully these cells tolerate the double sorting procedure very well and viability is very high >95%. For double sorting, set up another column, lubricate with 1 ml sorting of buffer and proceed from step 4.6. If imaging is to be performed, plate cells directly on to glass coverslips situated in 24 well dishes21 and coated with your choice of ECM molecule for cell attachment (e.g. collagen or laminin). Here, use 0.1-0.5 mg/ml collagen-I (Table 3). 5. Sorting of Human Muscle-derived Fibroblasts Immediately After Isolation. Immediately after isolation resuspend cells in complete medium and filter once though a 100 µm cell strainer and then again though a 40 µm strainer. Add 5 ml of PBS and spin at 657 x g for 6 min. Resuspend the cells in MACS sorting buffer and incubate in Anti-human Fibroblast Microbeads for 15-30 min at room temperature. Use the LS column and the Midi-MACS separator (Table 3) and install the 40 µm pre-separation filter. 6. Immunocytochemical Staining (1 day and overnight). Fix cells in their wells by the addition of an equal volume of 8% paraformaldehyde in ice-cold PBS for 10 min with gentle agitation. After 10 min aspirate fixative and wash twice with PBS. To immunostain cell surface antigens, block cells for at least 1 hr in 1% bovine serum albumin (BSA) in PBS and then probe with the relevant primary antibodies (Table 4). For intracellular antigens, permeabilize cells after fixation by addition of 0.2% Triton-X 100 in PBS with 1% BSA and NaN3 (0.01%) for 10 min, then block and incubate with primary antibodies. Perform all primary antibody incubations overnight at room temperature (or at 4 °C) with gentle agitation on a rocking platform. Remove unbound primary antibody and wash cells three times with cold PBS. Incubate for 1 hour incubation with species-specific fluorescently-labeled secondary antibodies (Table 4) at room temperature. After removal of unbound secondary antibodies, rinse cells with three exchanges of PBS and then counterstain with the fluorescent DNA dye Hoechst 33342 (1 μg/ml) solution for 10 min on a rocking platform. For the simultaneous visualization of both cell surface antigens and intracellular antigens, probe cells first with primary antibodies to cell surface antigens followed by their appropriate secondary antibodies. Next, re-fix the cells in cold PFA, permeabilize, block and incubate with primary antibodies against cytoplasmic or nuclear antigens followed by their appropriate secondary antibodies. After staining, remove coverslips from their wells using curved forceps and rinse the back of the coverslip using distilled water. Lay the coverslip cell slide down on a drop of anti-fade mounting medium22 set on a glass microscope slide. Reveal the lipid content of cells plated in 24 well dishes by staining with Oil Red O (1-([4-(Xylylazo)xylyl]azo)-2-naphthol)5,23. First prepare a stock solution of 0.5% (w/v) Oil Red O by dissolving 500 mg of Oil Red O in 60 ml of 99% triethyl-phosphate and 40 ml of distilled water. Maintain this solution at room temperature in the dark until use. On the day of use, make a 36% (w/v) triethyl-phosphate working solution, containing 12 ml of Oil Red O stock solution and 8 ml of distilled water. Filter this solution through filter paper number 42 to remove all crystallised Oil Red O (which impairs image quality). Gently warm this working solution in a water bath for 1 hr after which the solution is spun at 1,200 x g for 6 min. Remove the supernatant and filter again through filter paper (number 42) and transfer to a fresh 20 ml tube. After cells have been fixed, permeabilised and immunostained, remove the PBS and add 500 μl of Oil Red O/Triethyl-phosphate solution to the wells for 60 min. Triton-X at the concentration used here for cell membrane permeabilisation does not affect cellular lipid content23. NOTE: Oil Red O is excited by wavelengths between 540 and 580 nm and hence the Texas-Red filter can be used to detect Oil Red O emission in fluorescence microscopy23. Note that the fluorescence emission from Oil Red O can occasionally leak into the far red channel if cells are very strongly stained (i.e., very high fat content). After incubation, remove excess Oil Red O and rinse the cells five times with 500 μl of PBS. Mount the coverslips as for immunostaining as described in section 6. Detect Oil Red O dye by both brightfield/phase contrast microscopy or by epifluorescence microscopy using the Texas Red filter (shift free, EX BP 560/40, BS FT 585, EM BP 630/75, Carl Zeiss). NOTE: Ensure that slides to be compared quantitatively are stained with the same solutions, photographed at identical conditions (e.g., exposure, camera and acquisition settings etc.) and captured in the same microscopy session. All post-acquisition formatting should also be identical and be in strict accordance with suggested guidelines for digital images24. For image acquisition (widefield microscopy), turn on the microscope and fluorescence light source and leave for the recommended amount of time to allow the fluorescence light source to warm up and stabilize. Set the dark current for the camera by blocking the light path to the camera; acquire an image at maximum resolution and use this to correct subsequently acquired images. Illuminate immunofluorescent probes by epifluorescence delivered by liquid light guides (flexible tube of fluoroplastic filled with phenylmethyl silicone oil) and signals visualised through red (filter set 45 HQ Texas red shift free, green (filter set 44 FITC special shift free) and blue (filter set 49 DAPI shift free) band pass filters on an inverted epi-fluorescence microscope (10X, 20X, 40X, plan apochromatic objectives with 0.25, 0.75, 0.95 numerical apertures respectively). To avoid pixel saturation find the optimal exposure within the linear range of the detector for each fluorescent marker using the ‘Overexposure’ feature of image acquisition software. Make a note of the standardized exposure for each fluorescent label. Capture individual channels and save grayscale or pseudocolored tiff (tagged image file format) images files in the highest bit depth (preferably 16 bit - 65,536 gray values) provided by the recording device (e.g. cooled CCD (charged coupled device) fitted to the microscope). Set the image resolution to 1,388 x 1,040 or higher. Be sure to include a scale bar or object of known dimensions in the image. Where possible save files in 16 bit tagged image file format (.tiff) and not in .jpeg format to prevent loss of information25. If there are any concerns over the evenness of illumination (software bundled with microscope may have automatic correction for this) take a ‘flat-field’ image of coverslip without cells but stained and mounted in the same way as experimental slides; this can be used to correct for illumination defects post-acquisition in image analysis software. For image acquisition (confocal microscopy), optimize detector gain and laser power for each imaging experiment (avoid saturation). In general, the fluorescence measured is proportional to the laser power level. Set pinhole size to ‘1 airy’ to achieve best signal-to-noise ratio (improved resolution may be achieved at 0.5 airy for particularly strong signals). Take optical sections at different levels along the z-axis through the antibody-labeled cells and save a 16 bit maximum projection for each channel for image analysis. 9. Performing Measurements of Fluorescently Labeled Nuclear Transcription Factors Using Image Processing and Analysis Software (5 min per field of view). Access individual tiff image files and overlay corresponding channels by clicking and dragging one image into another. Each channel will then appear as a separate layer in the layers panel. Select lighten from the filter menu to allow layers beneath to be visualized concurrently. Alternatively, adjust the opacity of the top layers to 50%. NOTE: Tiff images can be saved with the ‘lossless’ Lempel–Ziv–Welch (LZW) data compression to lower file sizes without loss of information. In the analysis window (Analysis > Select Data Points > Custom), select Analysis and choose the measurements required (e.g., Integrated density, mean density, circularity, histogram etc.). Discard any unnecessary measurements by unchecking the box next to them. If area measurements are required in µm click on Analysis > Set Measurement Scale. The ruler tool will automatically appear – trace the length of the scale bar and enter its known length in micrometers. The software will then convert area measurements into square microns. NOTE: If the histogram analysis is selected, when measurements are recorded an additional folder will appear (the location of which can be chosen) with 8 bit histograms for each individual selection area in the micrograph as well as the summation of all individual selections (this always appears as Histogram-1 if multiple selections are made). This analysis cannot be performed by the software in 16 bit format, but is very useful for examining the distribution of pixel intensities throughout an object of interest. For analysis of nuclear fluorescence intensity first construct a representative ‘Color Range Selection Mask’ (CRSM) for Hoechst or DAPI stained DNA to define nuclear area. Once the desired channel images are overlaid, only the Hoechst channel layer should be left in view by ensuring the ‘eye icon’ adjacent to it in the layers tab is selected and then layer is highlighted (turns blue), whilst all other layers should be deselected. Make sure the blending dropdown is set back to ‘Normal’ in the layers tab. Open the Color Range dialogue box (Select > Color Range) and set the selection option dropdown to ‘Sampled colors’. With the selection preview set to ‘quick mask’ (red background) select all the blue color tones within the nuclei by holding the shift key (‘+’ sign appears) and clicking within the nuclei using the eye dropper tool that appears. If unwanted tones are selected, remove them by pressing the Alt key (‘─’sign appears) and clicking on them. Maintain the fuzziness scale at zero so that only manually selected color tones are included in the measurement and ‘Localized color clusters’ should be left unchecked. Save this CRSM to the computer’s hard disc as a-program-specific extract file (.AXT file). With another random field of nuclei, load, update, and save the CRSM (Select, Color Range, Load). Do this for at least five random fields to ensure that nuclear selections are representative. Use a colored version of a grayscale image for the creation of a mask to isolate features because the human eye is better able to discriminate between different shades of color than between varying shades of gray26. Use the nuclear CRSM to segment nuclear regions for staining. Once nuclei have been selected click on Image > Adjustment > Threshold and move the slider all the way to the right, such that the nuclei turn black. Alternatively, right click and select ‘Fill’ then choose ‘Fill to: black’. Then click on Select > Inverse and now press delete to remove all background (if the option appears choose ‘fill to: White’). This essentially binarizes the image based on your selection. Then load the watershed plugin from the filters tab to separate overlapping nuclei (Filter > Binary image > Watershed feature separation). If many nuclei are heavily overlapping, remove the nuclei from analysis by deselecting them (Hold the Alt key and loosely draw around them with the lasso tool). On the now binary nuclear layer, go to Select > Color Range and > Shadows, to select individual nuclei. Alternative hold shift and click within any one black nucleus. All nuclei will immediately be selected. Then transfer this selection to the layer containing nuclear transcription factor staining (e.g. myogenin) by selecting that layer and deselecting all other layers. Marching lines will now show the position of nuclei in the myogenin channel. If working with pseudocolored images only click on the Channels palette (to the right of the layers tab) and select only the green channel (the image will now appear gray). Then click on Image > Mode > Grayscale. A warning will appear ‘Flatten visible layers and discard hidden layers’ click OK, then another warning will say ‘discard other channels’ click OK again. Only a single layer of grayscale selected nuclei will now be present in the layers palette. Click Record Measurements in the Measurement Log to obtain data for the selected nuclei. If the layer to be analyzed (e.g. myogenin staining) is already a raw 16 bit grayscale image then simply press Record Measurements. NOTE: The Edit > step backward command (press all of Alt, Ctrl and Z keys simultaneously) restores all previous layers if required. Correct for non specific background fluorescence27 for results to be quantitative and comparable as measurements of fluorescence intensity are always a mixture of signal and background. Select the square selection tool and check ‘fixed size’ choose 20 by 20 pixels (or larger if desired and depending on the confluency of cells in the image). While holding shift select ten or more background areas spread throughout the field of view. Press ‘Record Measurements’ in the Measurement Log. Calculate the average integrated density (sum of all pixel gray values) per pixel of all 10 selected background regions (given as the ‘mean grey value’ in the Measurement log). Multiply the average background density per pixel by the number of pixels in the target object (i.e., each nucleus) to give average background per object. Subtract background fluorescence from the objects original integrated density to yield the final background corrected value. This approach accounts for potential field to field variation in non-specific background fluorescence. NOTE: It is of utmost importance to select only bona fide background regions as this correction has a considerable impact on the final values. Zooming in using the magnifying glass is recommended when making selections. It may also be useful to divide the general background corrected value by the area of the nucleus in pixels (same as taking mean grey level/intensity per nucleus) to minimize any potential influence of nuclear localized background signal that would contribute more to the integrated density value with increasing nuclear size (Figure 3C). 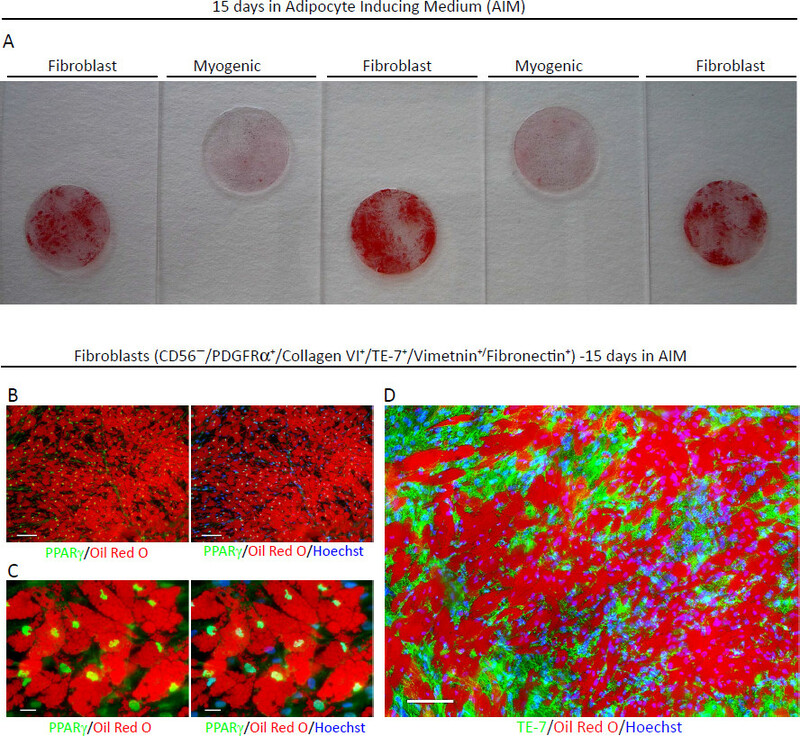 Purified myogenic cells and fibroblasts can be cultured in adipogenic differentiation medium for three days followed by adipogenic nutrition medium from anywhere between 7-30 days to assess their potential for adipogenesis. Using the purified cell populations, Oil Red O staining in combination with immunostaining for adipogenic and myogenic lineage markers showed that only the fibroblast fraction was capable of adipogenic differentiation (Figure 2). The massive accumulation of fat by the fibroblasts is visible to the naked eye (panel A), and their complete transdifferentiation is shown by the very strong expression of nuclear PPAR γ (Figure 2 panels B & C and Figure 3). By 15 days treatment, these cells have released any remaining TE-7 (a connective tissue antigen) onto their substrate (panel D). By contrast, myogenic cells maintain their normal phenotype including expression of desmin and myosin heavy chain (Figure 2 panels E & F) and do not upregulate nuclear PPARγ (Figure 3C). An example of quantitative analysis of a field of myogenic cells (desmin+) is shown in Figure 3. Panel B shows the field analyzed, and panel A shows the quantified fluorescence intensity (after background correction). This method clearly shows the variation of myogenin expression in individual nuclei at this specific seeding density and time point. Figure 3C demonstrates the utility of the method to directly compare transcription factor levels in different cell types on a cell-by-cell level. Here we show that CD56– muscle fibroblasts express a high level of the adipogenic transcription factor PPARγ whereas sorted CD56+ myogenic cells maintain only very low levels after exposure to Adipocyte Inducing Medium. Figure 1: Purified populations of myogenic cells and fibroblasts obtained by immunomagnetic bead sorting. (A-B) After one week in culture sorted myogenic cells express the cell surface cell adhesion molecule CD56 (N-CAM) and the muscle specific intermediate filament desmin. Nuclear ki-67 expression provides evidence that these cells are proliferating. The staining of membrane, cytoplasmic and nuclear constituents is described in protocol step 6.5. (C-D) Myogenic cells do not express the fibroblast marker TE-7. 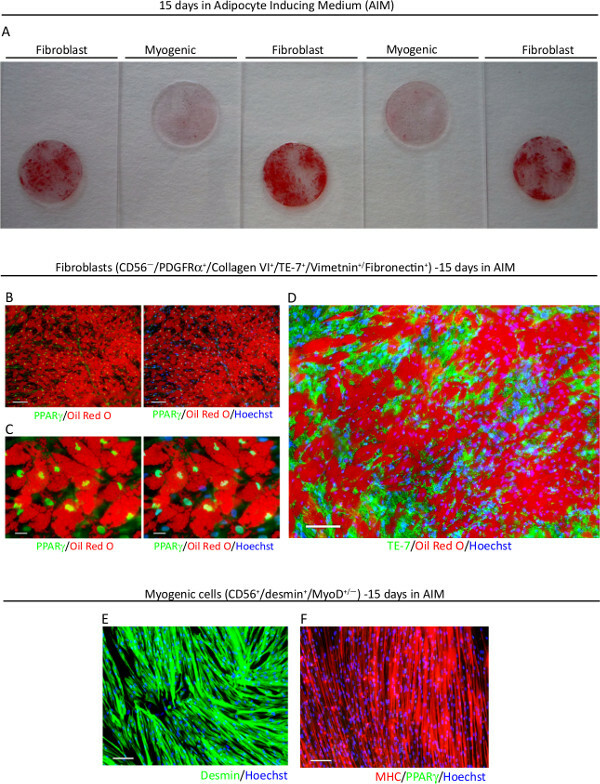 (E) Fibroblasts derived from human muscle express TE-7 and (F) the transmembrane platelet-derived growth factor receptor α (PDGFRα). Scale bars are: (A) = 20 µm; (B, C & E) = 200 µm; (D & F) 50 µm. Please click here to view a larger version of this figure. Figure 2: Human muscle-derived CD56‒/TE-7+ fibroblasts and CD56+/desmin+ myogenic cells cultured in Adipocyte Inducing Medium (AIM). (A) Fibroblasts isolated by MACS differentiate into adipocytes when cultured in Adipocyte Inducing Medium (AIM) and this can be seen easily by the naked eye following Oil Red O staining. Myogenic cells show no evidence of adipogenic differentiation after the same period of time in AIM and show very limited Oil Red O staining. (B & C) Human muscle-derived fibroblasts highly express PPARγ and CEBPα (not shown) after culture in AIM. (C) As the fibroblasts differentiate into adipocytes they release remaining intracellular ECM protein which forms a dense network around them. (E) Myogenic cell maintain their myogenic morphology and expression of lineage markers such as desmin and (F) myosin heavy chain (MHC), a marker of terminal myogenic differentiation, and fail to accumulate lipid. Scale bars are: (B, D) = 200 µm (E, F) = 100 µm; (C ) = 100 µm. Please click here to view a larger version of this figure. Figure 3: Sample data obtained from immunolabelled cultures using the image analysis method described (Adobe Photoshop Extended approach). (A) A cell-by-cell fluorescence intensity plot for the muscle specific nuclear transcription factor myogenin after 24 hr in serum free differentiation medium. 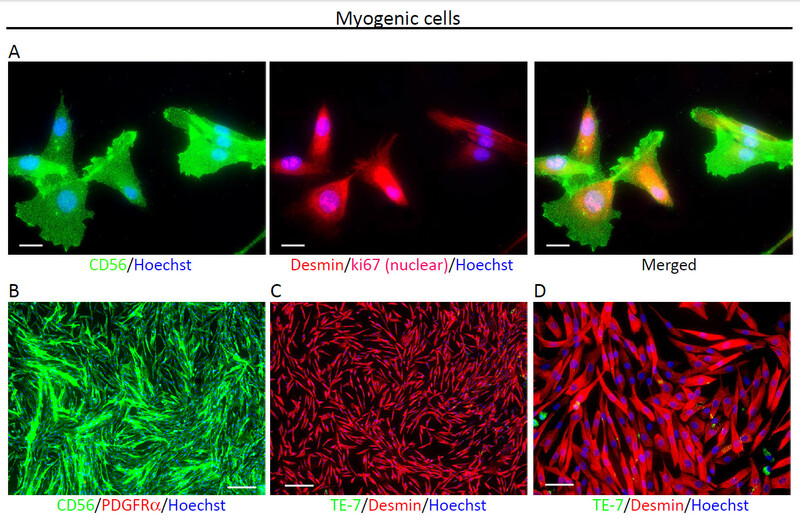 (B) Representative micrographs of desmin+/myogenin+ human myogenic precursors. Scale bars are: (B) = 50 µm. (C) PPARγ fluorescence intensity in individual nuclei from sorted CD56+/Desmin+ myogenic populations (CD56+) and CD56–/TE-7+/PDGFRα+/Collagen VI+ cells (CD56–) after culture in Adipocyte Inducing Medium for 15 days. The fluorescence values were normalized to nuclear area to account for variations in nuclear size between the two cell types. Horizontal black bars in (A) and (B) show the mean. Please click here to view a larger version of this figure. Table 1: Cell culture media components and concentrations. Table 2: Composition of adipogenic cell culture media. Large Cell Collumns Miltenyi Biotech 130-042-202 These columns come with a flow resistor. Use of the flow resistor is not necessary to obtain the high myogenic purities described here. MiniMacs Seperator Miltenyi Biotech 130-042-102 This separator fits the large cell column but not the LS column. Whatman Paper Sigma Z241121-1PAK No. 42, Ashless. To prepare the filter fold the circular filter paper to make a semi circle, then fold the semi-circle in half again to form a cone shape. Fit the cone into a funnel for filtering. ProLong Gold Antifade Reagent Molecular Probes, Invitrogen P36930 This can be purchased with or without DAPI and does not quench initial fluorescence. Table 3: Equipment and reagents. NEB: New England BioLabs, UK; MD: A. Menarini Diagnostics, UK; BD: BD Bioscience, UK. We have described an immunomagentic sorting procedure for the selective enrichment of human muscle-derived precursors from small samples of muscle biopsy material. This technique has been invaluable in our lab for overcoming the loss of human muscle-derived cultures to fibroblasts, but also for understanding the unique behavior of distinct populations of muscle-derived progenitors. Once purified myogenic cells can be investigated for changes in protein and/or gene expression, or used for downstream experiments. In addition to cell purification we also detail a rapid and straightforward method of analyzing specific regions of interest in micrographs from fluorescence microscopy. Digital images from fluorescence microscopy contain a wealth of information for cell biologists to extract; indeed pixels hold data that is not necessarily discernible to the human eye. With this technique quantitative data can be obtained about a large number of individual cells in a population. A unique feature of image analysis when compared to flow cytometry is the ability to correlate changes in protein expression with changes in cell shape orcell-cell interactions. Further, the capacity to create and save optimized and representative selection masks allows rapid, accurate and reproducible measurements to be made across many fields of view thereby reducing the potential for user bias. One benefit of this method is that cells can be successfully purified either immediately after isolation or after a few days in culture (when the yield will be higher). Crucially, myogenic cells should not be allowed to become confluent prior to sorting because this impedes their passage through the column, and will reduce the proportion of proliferative cells obtained for further expansion and experimentation. Depending on the initial tissue sample obtained, there may be a high number of non-adherent erythrocytes in the culture at this stage. Methods exist to selectively lyse erythrocytes, however to avoid any unnecessary chemical stress to the muscle-derived cells this step is avoided. We have not observed any notable negative impact of erythrocytes on the early culture of human muscle-derived cells, and these erythrocytes are removed by media changes once myogenic cells attach. Other methods of cell detachment just prior to sorting (e.g., other gentle proteases or EDTA based methods) may be used for cells in which the expression of the cell surface antigen is low or particularly sensitive to tryptic digestion. The expression of CD56 on human myogenic cells is strong and resistant to a short trypsinsation (when assayed with the antibodies described here). It is important that the sorting buffer contains EDTA to inhibit calcium-dependent cell-cell adhesion; this is crucial for obtaining (and maintaining) a single-cell suspension for sorting. Depending on the cell number, shape and sizes to be sorted, there is a choice to be made regarding the separating column (see Table 3). Removing the column from the magnetic field to release retained cells can be tricky so ensure that the collection tube (even if skirted) is placed in a holder positioned very close to the column to avoid loss of cells in transit. Although we have described this technique for use with human primary cells from skeletal muscle, this protocol can be easily adapted for other cell types for which a specific/unique cell-surface marker is known. Other advantages include the fact that the whole procedure can be carried out in the sterile working environment of a laminar flow cabinet. Also, the MACS procedure is gentler on the cells compared to FACS sorting because of low shear forces and can be a particular advantage for larger cells. The magnetic beads used are small, non-toxic and biodegradable in culture. Indeed, MACS has been successfully applied for the purification and study of a number of other cell types. One limitation of this technique is that MACS cannot easily be performed for multiple markers simultaneously. Also, the amount of marker and size of cells cannot be ascertained during the sorting process, only afterwards. The image analysis method demonstrated here provides a powerful tool to elucidate changes in the expression level of proteins on a cell-by-cell basis in large populations of cells. By exploiting the layers facility and selection masks in a widely-available software package, the experimenter can objectively select different fluorescent signals across multiple images, to allow quantification of individual features, and any number of components within them. We have successfully used this method to quantify and directly compare the range of transcription factor expression in different cell populations exposed to an adipogenic challenge. Each fluorescence channel (representing a specific marker) can be kept separate from the others and turned on or off as required, which is useful for multi-color immunolabelling experiments. A number of factors must be taken into consideration when attempting to extract quantitative and semi-quantitative data from fluorescence microscopy28. Attention to these will permit basic semi-quantitative measurements to be made. Often researchers wish to use a number of fluorochromes to label different proteins of interest; of prime importance is the ability to be able to distinguish between individual emission spectra. In most cases this is achieved by selective excitation of only one fluorochrome at a time. However, if emission and/or excitation spectra overlap significantly or are inadequately filtered then bleed-through or cross-talk may compromise the accuracy of the image data obtained. Bleed through is the passage of fluorescence emission in an inappropriate detection channel and is caused by an overlap of emission spectra29,30. Some points to consider are: choosing fluorochromes which have well separated excitation and emission spectra, using very selective excitation wavelengths (as is achieved by lasers in confocal microscopy), ensuring that emission filter sets are stringent enough to exclude unwanted wavelengths, and performing multicolor imaging on the longest (i.e., the ‘reddest’) wavelength peak emission dye first to account for the fact that absorption spectra are generally skewed towards shorter wavelengths (blue light) whereas emission spectra are skewed towards longer wavelengths (red light). The spectra of the fluorescent labels are available at ‘Fluorescence Spectraviewer’ provided by Invitrogen. The use of high quality objectives is crucial for images destined for analysis. A high numerical aperture (>1.3) is best and magnifications should be adapted to the camera in widefield microscopy. In both widefield and confocal microscopy, the NA is critical, as z-resolution improves as a function of the numerical aperture squared29. Where possible make use of plan-apochromatic lenses which are corrected for both spherical and chromatic aberrations29. Use of liquid light guides is strongly recommended as they reduce uneven illumination by scrambling the source illumination to reduce spatial and temporal coherence prior to its entry into the microscope objective29. It is important to avoid saturation of images, as saturated pixels cannot be properly quantified due to clipping of information at the most intense grey level values26. Various ‘plugins’ may be available to enable flat-field correction procedures to performed with relative ease; for example Dr. John C. Russ has made many of these available free online (http://www.drjohnruss.com/download.html). Using this plugin the ratio of the brightness of each pixel in the experimental micrograph to the corresponding one in the reference image is calculated and replaces the original. The results are then scaled to fill the brightness range of the image. Alternatively, the image calculator of ImageJ is another means of correcting for uneven illumination. For some image analysis, confocal microscopy may be the method of choice as it prevents out-of-focus fluorescence from reaching the detector29. However, this approach can take substantially longer than widefield fluorescence microscopy, limiting the number of individual fields of view that can be obtained in a single session. Recently other methods have been reported for the enrichment of myogenic cells from human muscle tissue. Bareja31 used a combination of MACS depletion (for: CD11b, CD31, CD34 & CD45) followed by FACS for positive selection of CXCR4+/CD56+ myogenic cells. However, although this procedure was able to generate a highly enriched myogenic population, it is considerably lengthier than the method detailed here, contains many more consecutive steps and results in a lower yield of purified myogenic cells lower per gram of tissue. In another recent study, Castiglioni32 isolated myofibre-associated cells from human fetal muscle by FACS using multiple markers and showed that CD34–/CD56+/Pax7+ cells (archetypal satellite cells) can exhibit osteogenic as well as myogenic lineage potential, but in general agreement with our work do not show adipogenic potential. These authors also showed that CD34+/ PAX7– cells were non-myogenic, but were capable of adipogenic and osteogenic differentiation. 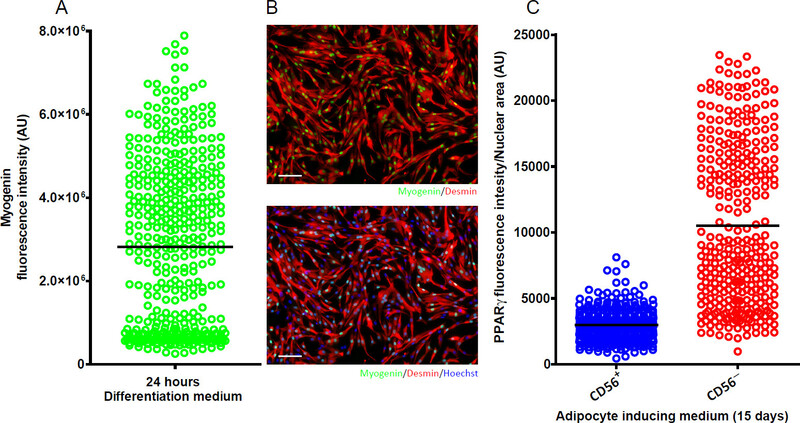 The enrichment of CD90 expression (a marker of muscle fibroblasts 33) in the CD34+ non-myogenic fraction suggests that a large proportion of these cells may have been fibroblasts, which have been shown to be the major source of adipocytes in adult human skeletal muscle cultures (reference 5 and Figure 2). Whether muscle-derived fibroblasts also have osteogenic differentiation potential warrants further investigation. The authors wish to thank Carl Hobbs and Lindsey Majoram for their technical assistance, and Professor Pat Doherty for use of microscopy facilities. Dr. Agley was supported by a studentship from King’s College London. Funding from the Spurrell Trust is also acknowledged. Mauro, A. Satellite cell of skeletal muscle fibres. J. Cell Biol. 9, 493-495 (1961). Hawke, T. J., Garry, D. J. Myogenic satellite cells: physiology to molecular biology. J. Appl. Physiol. 91, 534-551 (2001). Yin, H., Price, F., Rudnicki, M. A. Satellite Cells and the Muscle Stem Cell Niche. Physiol. Rev. 93, 23-67 (2013). Alsharidah, M., et al. Primary human muscle precursor cells obtained from young and old donors produce similar proliferative, differentiation and senescent profiles in culture. Aging Cell. 12, 333-344 (2013). Agley, C. C., Rowlerson, A. M., Velloso, C. P., Lazarus, N. R., Harridge, S. D. R. Human skeletal muscle fibroblasts, but not myogenic cells, readily undergo adipogenic differentiation. J. Cell Sci. 126, 5610-5625 (2013). Murphy, M. M., Lawson, J. A., Mathew, S. J., Hutcheson, D. A., Kardon, G. Satellite cells, connective tissue fibroblasts and their interactions are crucial for muscle regeneration. Development. 138, 3625-3637 (2011). Webster, C., Pavlath, G. K., Parks, D. R., Walsh, F. S., Blau, H. M. Isolation of human myoblasts with the fluorescence-activated cell sorter. Exp. Cell Res. 174, 252-265 (1988). Pasut, A., Jones, A. E., Rudnicki, M. A. Isolation and Culture of Individual Myofibers and their Satellite Cells from Adult Skeletal Muscle. J. Vis Exp. e50074 (2013). Kuang, S., Kuroda, K., Le Grand, F., Rudnicki, M. A. Asymmetric Self-Renewal and Commitment of Satellite Stem Cells in Muscle. Cell. 129, 999-1010 (2007). Mackey, A. L., et al. Assessment of satellite cell number and activity status in human skeletal muscle biopsies. Muscle a d Nerve. 40, 455-465 (2009). Stewart, J. D., et al. Characterization of proliferating human skeletal muscle-derived cells in vitro: Differential modulation of myoblast markers by TGF-β2. J. Cell. Physiol. 196, 70-78 (2003). Miltenyi, S., Müller, W., Weichel, W., Radbruch, A. High gradient magnetic cell separation with MACS. Cytometry. 11, 231-238 (1990). Clarke, C., Davies, S. Ch. 2. Methods in Molecular Medicine. Metastasis Research Protocols. Brooks, S. A., Schumacher, U. 58, Humana Press. 17-23 (2001). Grützkau, A., Radbruch, A. Small but mighty: How the MACS-technology based on nanosized superparamagnetic particles has helped to analyze the immune system within the last 20 years. Cytometry Part A. 77A, 643-647 (2010). Tomlinson, M. J., Tomlinson, S., Yang, X. B., Kirkham, J. Cell separation: Terminology and practical considerations. Journal of Tissue Engineering. 4, (2013). Agley, C. C., Velloso, C. P., Lazarus, N. R., Harridge, S. D. R. An Image Analysis Method for the Precise Selection and Quantitation of Fluorescently Labeled Cellular Constituents: Application to the Measurement of Human Muscle Cells in Culture. J. Histochem. Cytochem. 60, 428-438 (2012). Danoviz, M., Yablonka-Reuveni, Z. Ch. 2. Methods in Molecular Biology. Myogenesis. DiMario, J. X. 798, Humana Press. New York, NY. 21-52 (2012). Bergström, J. Muscle electrolytes in man. Determined by neutron activation analysis on needle biopsy specimens. A study on normal subjects, kidney patients, and patients with chronic diarrhoea. Scand. J. Clin. Lab. Invest. 14, 7-100 (1962). Chazaud, B., et al. Satellite cells attract monocytes and use macrophages as a support to escape apoptosis and enhance muscle growth. The Journal of Cell Biology. 163, 1133-1143 (2003). Abou-Khalil, R., et al. Autocrine and Paracrine Angiopoietin 1/Tie-2 Signaling Promotes Muscle Satellite Cell Self-Renewal. Cell Stem Cell. 5, 298-309 (2009). Timpl, R., Kvonder Mark, Role of laminin and fibronectin in selecting myogenic versus fibrogenic cells from skeletal muscle cells in. 117, 628-635 (1986). Lichtman, J. W., Conchello, J. -A. Fluorescence microscopy. Nat Meth. 2, 910-919 (2005). Koopman, R., Schaart, G., Hesselink, M. Optimisation of oil red O staining permits combination with immunofluorescence and automated quantification of lipids. Histochem. Cell Biol. 116, 63-68 (2001). Rossner, M., Yamada, K. M. What's in a picture? The temptation of image manipulation. The Journal of Cell Biology. 166, 11-15 (2004). Zinchuk, V., Grossenbacher-Zinchuk, O. Recent advances in quantitative colocalization analysis: Focus on neuroscience. Prog. Histochem. Cytochem. 44, 125-172 (2009). Johnson, J. Not seeing is not believing: improving the visibility of your fluorescence images. Mol. Biol. Cell. 23, 754-757 (2012). Waters, J. C. Accuracy and precision in quantitative fluorescence microscopy. The Journal of Cell Biology. 185, 1135-1148 (2009). Pawley, J. The 39 steps: A cautionary tale of quantitative 3-D fluorescence microscopy. Biotechniques. 28, 884-887 (2000). Bolte, S., Cordelières, F. P. A guided tour into subcellular colocalization analysis in light microscopy. J. Microsc. 224, 213-232 (2006). Brown, C. M. Fluorescence microscopy - avoiding the pitfalls. J. Cell Sci. 120, 1703-1705 (2007). Bareja, A., et al. Human and Mouse Skeletal Muscle Stem Cells: Convergent and Divergent Mechanisms of Myogenesis. PLoS ONE. 9, e90398 (2014). Castiglioni, A., et al. Isolation of Progenitors that Exhibit Myogenic/Osteogenic Bipotency In by Fluorescence-Activated Cell Sorting from Human Fetal Muscle. Stem Cell Reports. 2, 560 (2014). Fukada, S. -i, et al. CD90-positive cells, an additional cell population, produce laminin α2 upon transplantation to dy3k/dy3k mice. Exp. Cell Res. 314, 193-203 (2008). Stickland, N. Muscle development in the human fetus as exemplified by m. sartorius: a quantitative study. J. Anat. 132, 557-579 (1981).